Very cost effective all-in-one solution! Native Mobile Applications available in iOS and Android versions. Generates reports or export data to Excel. Allows creation of Certificates for your CEU/CPE/CME. Generates online website and registration for your events. i-Attend Cloud is designed to work with RFID badges or Barcode IDs to track attendance. We support RFID Wedge/Keyboard and Network readers. We also support Barcode Wedge/Keyboard and Batch Scanners. Leverage your existing investment in RFID badges, or your Barcode IDs. No more sign in sheets with unreadable names or manual tracking. Simply, tap or scan your badges to be authenticated. You can also do a name look-up in case badge is not available. 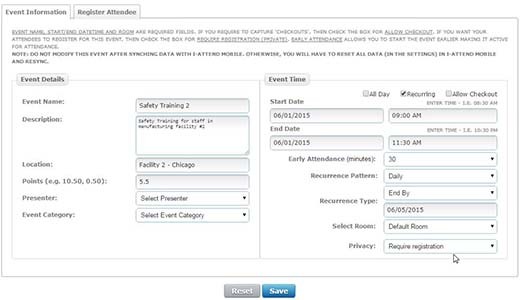 i-Attend tracks attendance by event so all the sessions, classes, or meetings need to be created. You can capture a check-in only or also capture check-outs. 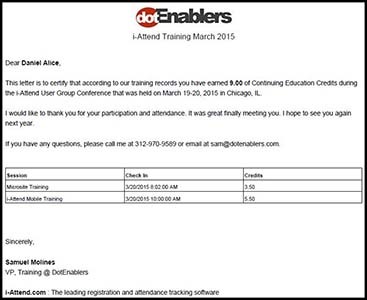 You can assign points to your events and attendees can earn by their attendance. Create a one-time, all-day or even a recurring event. You can also assign an event to a particular tag(s). Create Certificates for CEU, CME, CPE or other continuing education programs. i-Attend has a built-in POINT system. You can assign points to your events and participants who attend earn the points. There are a lot of competing software that offer the same Certificate functionality, but guess what - they are super expensive! 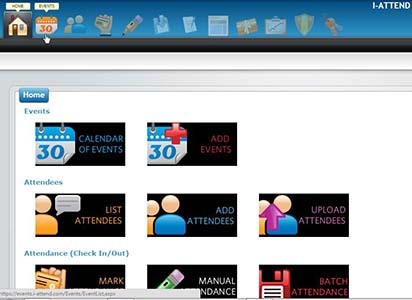 i-Attend offers this and a lot more for your attendance tracking needs. Very powerful! Another awesome module is our Microsite module. It allows you to create a custom website for your events and allows your attendees to register online. 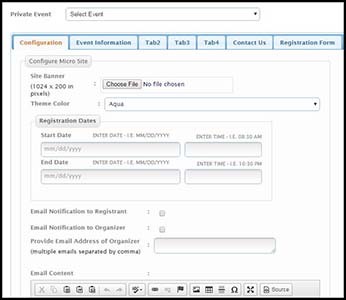 Publish your event online through a custom website with a registration function. Powerful yet inexpensive solution for your event, registration and attendance tracking requirements! 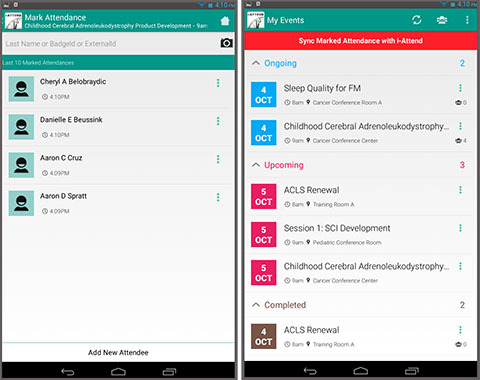 Android and iOS versions of i-Attend Mobile. Sync data with i-Attend Cloud and capture attendance offline or remotely. Our mobile apps supports RFID, Barcode and Name look-ups to authenticate your attendees.